That said, we don’t really know the reason why Google sometimes shows the search box for branded queries for sites that have implemented the markup, and sometimes doesn’t. While we don’t know what Google’s criteria are behind the search box algorithm, we have the data to definitely see that there’s a correlation between the traffic of the websites and the appearance of the markup. Using a SimilarTech “Websites using SearchAction Schema Entity” report, we compiled a list of websites implementing the above schema. We chose over 300 websites to sample, with varying traffic volumes. Then we researched each site and checked if Google was displaying a sitelinks search box when searching for the URL. If we found a search box wasn’t displayed, we looked at the website in question to see if there were technical issues (based on Google’s setup instructions). Finally, we analyzed the results and produced the most common scenarios that would prevent Google from showing the sitelinks search box for a website. As you can see in the chart, amongst the sites with SearchAction schema markup, there’s a definite correlation between website traffic and the likelihood that the searchbox will appear in Google search results. There were just a few sites (2.5%) with 100K monthly desktop visits where the searchbox was displayed. 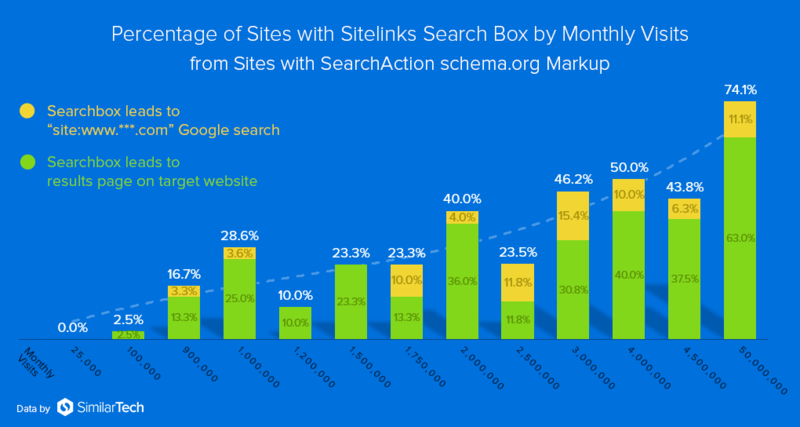 By contrast, nearly three-quarters of the sites with 50M monthly desktop visits had the sitelinks searchbox. Monthly desktop visits – the number of average monthly desktop visits to the website according to SimilarWeb‘s analytics. The biggest difference between the custom search box and the “site:” search box: Searches inside the custom search box will redirect you to the website results page in the website itself, while the searches in the site:searchbox will lead you to a second search within Google. This occurs when the “URL” attribute’s value doesn’t match the canonical URL of the domain’s homepage, or there are problems with the canonical tags of the main domain. This can be tested by using Google’s structured data testing tool and checking for problems with the URL value. The “target” attribute in the markup should point to the search results page URL on the website, including a placeholder for the query input parameter name, wrapped by curly braces. “target” attribute is not defined in the markup or defined incorrectly. The field of the target in the markup isn’t defined well. The value of the “query-input” name attribute doesn’t match the string that’s inside the curly braces in the “target” property. You need to make sure that the value of the “name” will match, otherwise it won’t work. Use this tag and, you guessed it, Google won’t show the searchbox. But unless you’re actively trying to disable the searchbox markup, this is likely one of the least common scenarios. First, there’s a very strong correlation to site traffic. This is perhaps the main factor that determines whether or not Google will show the search box, even if all technical issues are addressed and schema is implemented correctly. Again, out of the websites we sampled that have more than 50M monthly desktop visits, 74% of them have sitelinks searchbox for their websites. When we checked the websites that have just 25-100K monthly visits, however, only 1.4% had the searchbox working for their site. As you can see, there are several factors that affect the searchbox appearance in Google’s search results. But if you play your cards right and do your due diligence, getting those valuable searchboxes to appear is easier than you think.